From technology strategy to team collaboration, contact center, and beyond, there was a lot of buzz ‘everywhere’ at Enterprise Connect 2018. Usually when I look back on an Enterprise Connect show, a few technologies or ideas stand out above the others as the hottest things at the show. 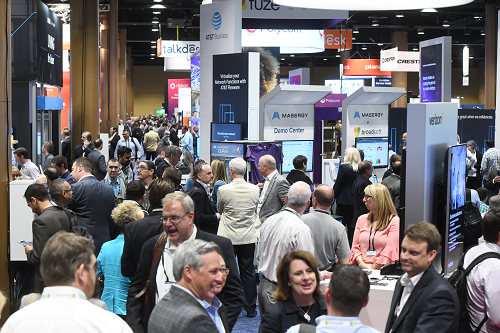 Last year, our "Communications 2020" conference-within-a-conference was an obvious hit -- four of the "2020" strategic technology-focused sessions ranked in our top 10 best-attended sessions. In prior years, the buzz has been around WebRTC, and before that, yes, SIP. The show we just completed, Enterprise Connect Orlando 2018, was different. The room counts, registration numbers, and show floor -- as well as our exhibitors' and attendees' reactions to them -- all tell me that there's not much in our industry today that can't be considered a hot technology. Sessions on Team Collaboration drew large crowds, and this was also one of the first topics you'd hear about from people when you'd ask them what was on their minds. The enterprise folks I talked with seemed pleasantly surprised by the rate of adoption and satisfaction they were getting with these tools, especially with Microsoft Teams. Many still talk about the need to drive user adoption with UC in general, and to help users get the most out of these tools. But it does seem to me, at least from anecdotal evidence, that Team Collaboration tools are now routinely considered an essential part of the UC conversation. We also saw consistently full rooms for the Contact Center sessions. This should also not be much of a surprise; Contact Center is a natural early adopter of technology within enterprise communications. But it's more than that -- the amount of innovation happening in contact centers is really remarkable. There's technology innovation via artificial intelligence (AI), like you see with Genesys Kate; there's the overall move to Cloud Contact Centers, where Avaya is bolstering its comeback with its acquisition of Spoken. But there's also innovation in the pricing model, as newcomer ZaiLab joins Amazon Web Services Connect in offering consumption-based pricing. And then there's Twilio jumping into the market with a new type of cloud model via its Flex service. Big crowds showed up for the return of our strategic technology conference-within-a-conference, which we creatively titled "Communications 2021" this year -- reflecting our continuing desire to look three years into the future. And in our track on Cloud Communications, the best-attended sessions focused on the practical realities of Cloud -- "Avoiding the 'Gotchas' in a Cloud Migration" and "Decision Factors in Choosing a UCaaS Provider" topped the list. I could go on. We drew strong crowds in the Video sessions, and sessions on SIP Trunking and SBCs remain a strong interest. Finally, the session that traditionally draws the biggest crowd -- Brent Kelly's and Phil Edholm's in-depth examination of "Cisco vs. Microsoft" -- was a blockbuster at this year's show. The crowd went well over capacity for the room (the largest breakout room we had available), and we had to put speakers and a monitor out in the hallway for the overflow crowd. Given that this is the first EC since Microsoft announced the Skype-to-Teams shift, it's not surprising that this topic garnered so much interest; the session that followed it, Kevin Kieller's deep dive into the Microsoft product strategy shift, was also a huge draw. So honestly, there was just a lot of buzz everywhere at the show this year. As Dave Michels writes on No Jitter this week, the industry is clearly on an upward trend. Pent-up demand is finally being released; new technologies are emerging to meet the demand; new companies are coming in to challenge the established players; and the role of the communications organization within the enterprise is clearly changing -- in positive, career-enhancing ways. All in all, a big week. The industry's in a strong place right now.